Whenever I park somewhere, I take a picture. Or two. Or more. 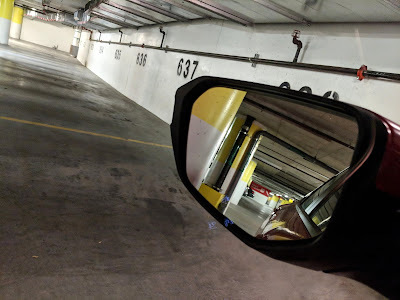 Ostensibly, I'm trying to make it easier to find my car when I return later, but beyond that the photos serve as a marker of how I was feeling at that particular moment. They say it's the journey, not the destination. And to a certain extent, they, whoever they may be, are right. We spend so much time thinking about the "there" part that we forget about how we get there in the first place. Or what it's like after we leave and head for home. Which is something of a lost opportunity, because a lot happens between point A and point B. As it was, this lot is under the hospital, and we were on our way to see Debbie's dad. It was another early morning among a long series of challenging early mornings - and days, and weeks... - of roller coaster-like illness drenched in overriding grief. So, all things considered, not a fun journey. But a journey all the same. And above it all, I was - and am - on it with her. Which is why it felt temporarily comforting to compose a weird shot out the car window after we parked. For a blink of a moment in the middle of so much darkness, I got to have some fun with light, and I got to have a sliver of normality with the woman who not only knows me better than I know myself, but who also needed a reason to hit pause for a few seconds before we headed upstairs. Finding my car again at the end of the day was an added bonus.